After much waiting, the Elfquest feature may finally be on its way! After it looked like all hopes for a feature based on Richard and Wendy Pini's beloved graphic novel series Elfquest were gone, news has broken that producers Stephanie Thorpe and Paula Rhodes have acquired the film rights and are moving forward with development. If those names sound familiar, it's because they are the pair behind the live-action short, Elfquest: A Fan Imagining, which has been making the convention rounds and can be found on YouTube. 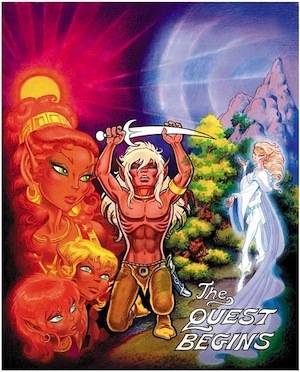 An Elfquest movie had been in the works for a while, but was seemingly dead when Warner Bros. dropped it, claiming they didn't want to compete with The Hobbit. And in case you weren't already aware, Boing Boing runs new Elfquest strips every Monday! Here is the most recent installment, "The Palace Disguised." You can also find all the strips in convenient post form here.